FIND THIS NEW GAME ON KICKSTARTER! The Apple Core is one of 13 different types of trash items in the game. There are seven of each type, for a total of 91 trash cards. Dumpster Brawl has an attractive theme with terrific artwork wrapped around a simple set-collection mechanic. You are a critter in search of trash, and if you manage to collect at least three sets of three or more matching trash types, you have nearly won. That’s right, there’s a good chance you haven’t won just yet. That’s because you also have to get rid of any extraneous cards (i.e., cards not part of one of your matching sets) before declaring victory. This fast-paced card game has you constantly deciding between taking new cards — whether it be from the draw deck, discards or even another player — and getting rid of cards. Sure, having 20 cards in your hand increases the likelihood that you will eventually find/have matching sets, however this also puts you deep into the trash heap, so to speak. You’ll inevitably have to spend a good deal of time and quite a few turns trying to unload all the cards that are not part of a matching set. Now there’s far more to this game than just drawing and discarding cards. One of the creative mechanics — and I’m pleased to see this in a card game — is the use of combat dice. Besides getting to draw or discard a card on your turn, the dice open the door for doing much more. As your dumpster-diving critters are fighting over a trash heap, combat is inevitable! Select another player to fight for your right to root around the dumpster for more cards, and roll your combat dice against him. The player you’ve targeted rolls, too. If the attacker beats the defender (rolls more swords than the defender rolls shields), the attacker can dump one of his cards into the defender’s hand or take one away. But that’s not all! (Winning a die roll is gold in this game, in case you haven’t guessed.) The attacker now rolls once again — called a Rummage Roll — and the results indicate how many cards the player may draw and how many he may discard. It’s all optional, but with six dice, chances are you’ll be taking in or dumping a good deal of cards and hopefully altering your hand for the better. It pays to win your attack roll. Conversely, if you lose your initial combat roll, the defender gets to mess with your hand in a similar fashion and your turn ends. The exchange of cards in the game has you drawing 1 or 2 cards from the deck, from a player’s hand, and discarding into players’ hands and into the discard pile. We found keeping track of our options a little tricky at first, and we had to refer to the rules often during our first game. The other players in my group agreed that a card with available options for each player would be a helpful addition for new players. Or you can just have a better memory than us. This is one of six player placards. Note the empty soup can on the lower-left. Each character comes with its own special trash type, indicating that the player only needs to collect two of that trash type (instead of the usual 3) to complete a set! Besides all manner of trash to collect, there are a few card types designed to stink things up. First, you have the Slugs. These truly are trash. They only exist to to muck up your hand. You must find a way to discard them to win, and they can’t form their own set. Second, you have Blockers. While Blockers are optional, they add a layer of difficulty to the game in that as soon as you draw a Blocker, you have to overcome it with a die roll in order to continue your turn. On the helpful side there are Booster cards (also optional) that can give you the opportunity to re-roll your dice. Boosters are held in-hand until just the right moment. An additional optional card I would have liked to see in the game is a Wild Card. For people who want to play a quicker or even easier game, I think the addition of cards that match multiple trash types would be a fun addition. 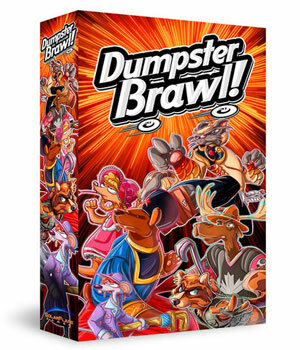 In the end, Dumpster Brawl — while simple on the surface — offers varying levels of gameplay (the game comes with different versions) that make for an entertaining “filler” game or family game to play with kids. The element of chance is high, but the inclusion of combat dice, as well as a variety of draw and discard options, give the players some nice strategic choices along the way.